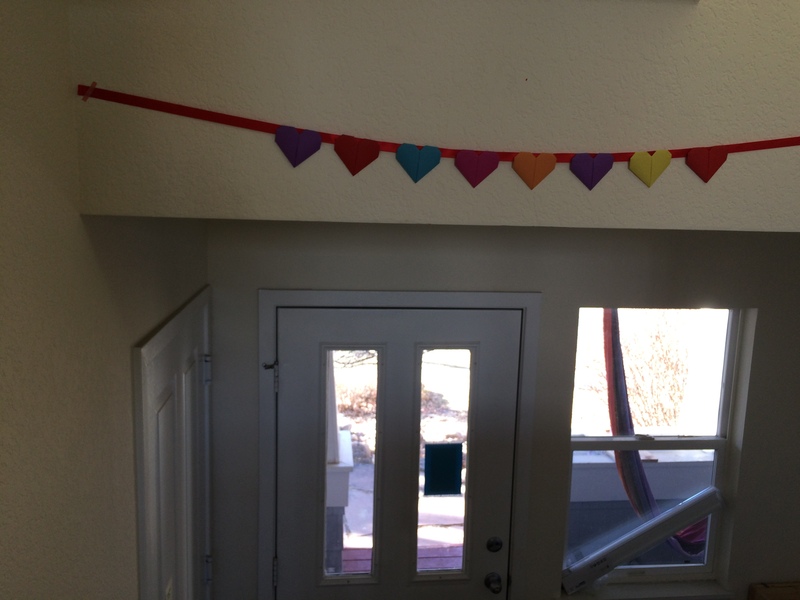 For a Valentines craft, we made hearts. I got the idea from Loesje. If you are looking for a Dutch tutorial, Loesje made a great one! 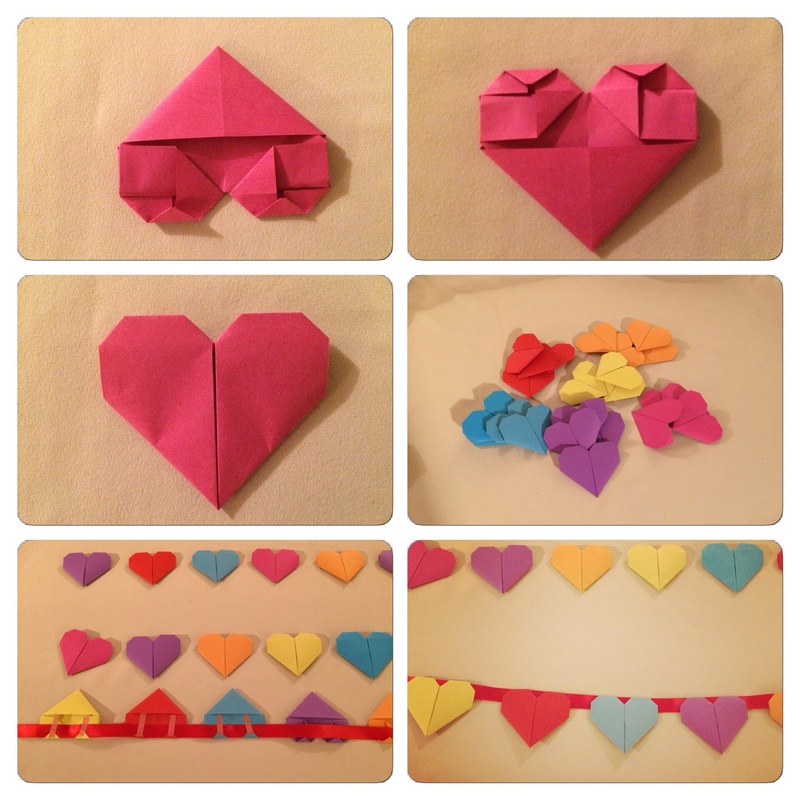 We cut out card stock and made cards where we glued the heart made from origami paper, at the front of the card. You will find the instruction on how to fold a heart, below. I must admit, I am not that good in writing folding instructions. It is easier to show it. So let me know where I can change my instruction or if you like a video tutorial. You should follow the photos rom left to right and top to bottom . 1. 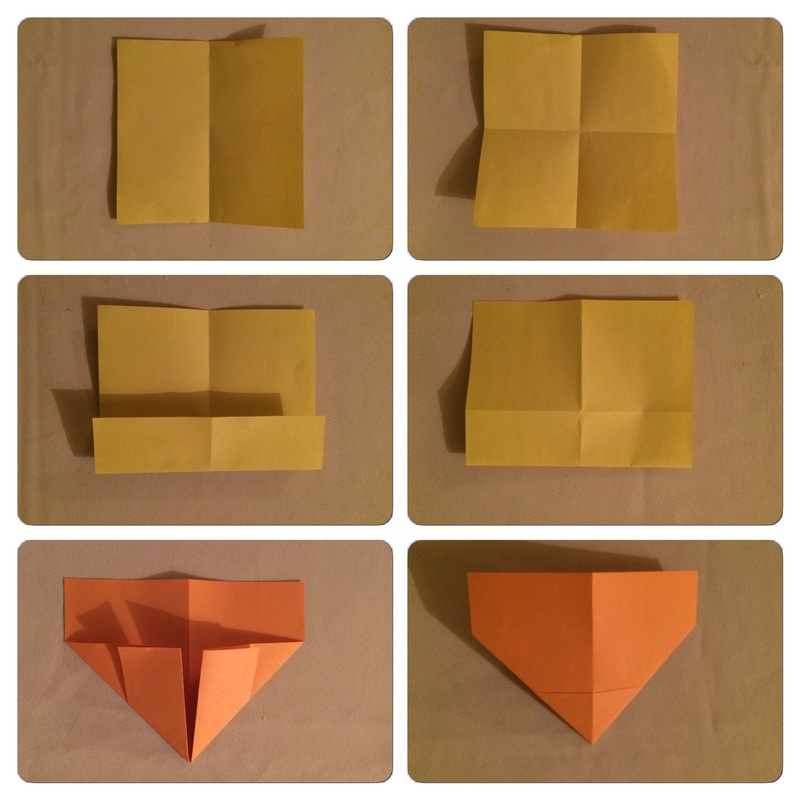 Take a square origami piece of paper, I used these, and fold it. 2. Fold it again and open your piece of paper. You see you have a folded cross on the paper. 3. Fold the top part to the half of the paper sheet. This wil be the inside of the heart. Just in case you have origami paper with one colored side. 5. Fold the left and right tip to the line in the middle of your paper sheet. This will be the frontside of the origami heart. 6. Turn you paper sheet around again. It should look like this. With a small triangle visible. You need this small triangle later to fold in another part of your creation. I will get back to that. 8. Fold the two visible squares at the top to little triangles. Now your paper sheet has a triangle shape at the top and at the bottom. 9. Now you fold the bottom triangle on top of the bottom triangle. You see that at the bottom part of your creation, two parts kind of open. You have to push these open and fold the little triangle that exists inside, towards the folding line. 10. This is how it should look like. 11. Now move the top parts a little from each other. Remember the little triangle you had at step 6. That is the lower triangle. Tuck the upper triangle into the space of the lower triangle. 12. You see what it looks like? Now we concentrate on the lower part of your creation. 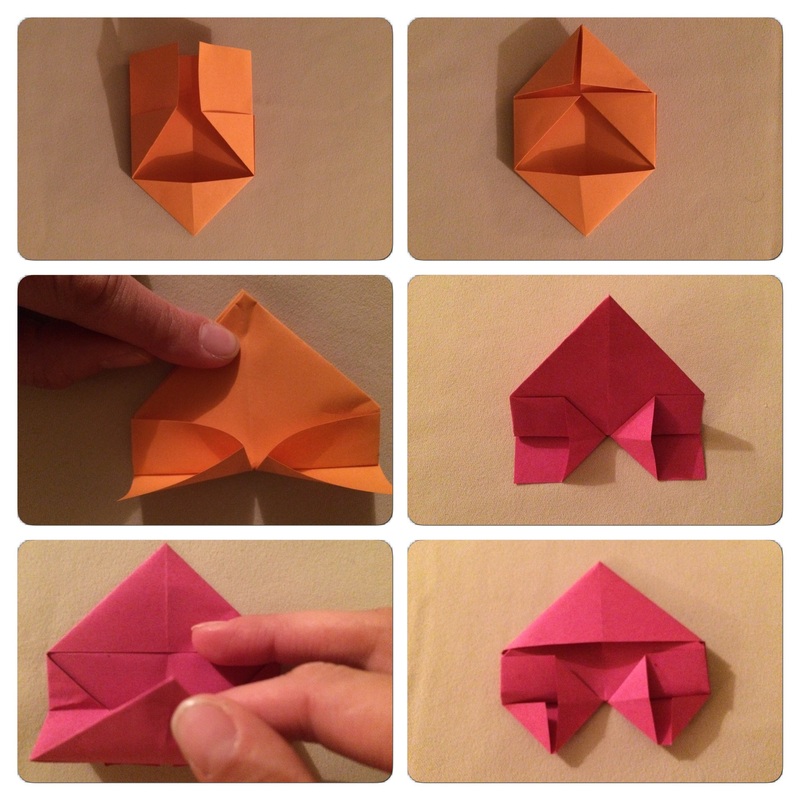 The part we folded in step 9. On the left and right side is a small square, fold both into a triangle. 13. Fold the point to the folding line. You will fold it in half. 14. Turn your creation 180 degrees. It should look like this. The last folding you did, to make it a heart shape, I will get back to that one too. 15. Turn your creation around. Here you have your heart. 17. I attach the hearts to a satin ribbon and used wash tape to attach the part we folded in step 13 and how it looked in step 14. 18. Turn it around after you taped all the hearts to the ribbon. 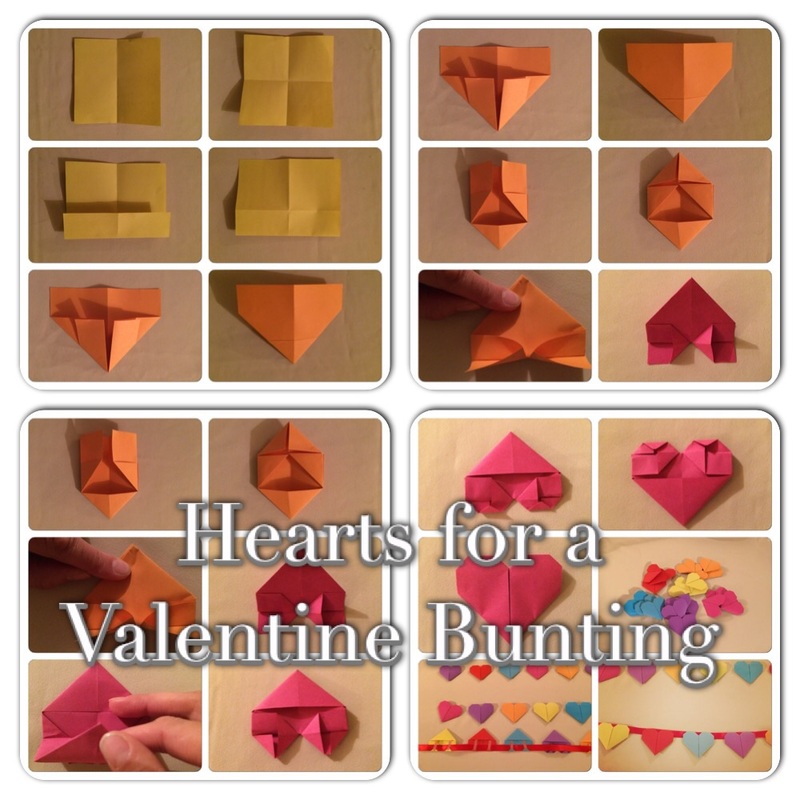 And there you have you Valentine Heart Bunting.